A tasty Danish pancake, but really you can't think of it as a pancake because it is oh, so much better. opt. Jam, Sugar, Cinnamon Sugar These are what we like to dip them in. 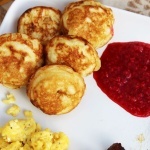 Begin heating your Aebleskiver pan on medium heat. Combine flour, eggs and salt and mix thoroughly in a mixer. Gradually add buttermilk (it is important to do it gradually or it will be very lumpy). Mix until not lumpy then ADD BAKING SODA. I almost always forget this step. If you forget, you will notice in the first batch that it doesn't rise, that is your sign that you forgot the soda. They do not taste good without the soda!! Place a small amount of shortening in each cup of the pan. You will need to do this each time before putting batter in. Allow to cook till you think the one side is golden brown then use a fork to roll it so the other side can cook till golden as well. Repeat till batter is gone. Serve warm dipping in sugar, jam, cinnamon sugar, powdered sugar, or syrup... So many things to try. Find your favorite combination. Enjoy! Family traditions are the best! This is such a great tradition and looks so yummy!! My husbands family came from Denmark and I had been thinking that it would be fun to try to make a meal from there. These would be perfect. I’m sure my kiddos would love little bite size pancakes. Aliza, you should definitely try them. I know your kids will love them. Mine are always asking when we can make them again. Enjoy!! Well those look delish! Thanks for sharing!!! How do you pronounce that? Ha Ha! I am heading to Amazon to buy one of those pans now. My kids will love this breakfast for Christmas Morning. eb-lu-skee-vers 🙂 Hope that helps. I’m so happy you are going to try them. Remember to season your pan before you use it. Christmas is a great day to make them, just make sure you don’t stay up till 2am wrapping gifts or you might be too tired. LOL! This tradition I have shared with several of my good friends. I have made them with their families and the kids love them! I get random texts saying the or kids want me to come over and make Æbleskivers for them. I guess historically, the Danish would put a bit of fruit in the batter before turning them over. The word Æbleskiver translated from Danish means apple slices. So we have toyed with putting chunks of apples, peaches, blue berries, black berries, banana, pears and pineapple. They all tasted great! I bought a bigger pan from Logdgetech with bigger cups. We even put ago sausage and cheese, they were delicious. Still nothing beats dipping one in cane sugar, and Maid Marrion jam! Anyway, my friends liked them so much, I actually gave out a dozen or so pans as gifts with this recipe, and I still get picture messages with their own Æbleskivers and thanks for the pan/recipe. I wish the whole world could have these for breakfast!